Good morning! It’s going to be cold and cloudy in London today. Here’s the tech news you need to know this morning. 1. Apple may be planning to kill off the iPad Mini. 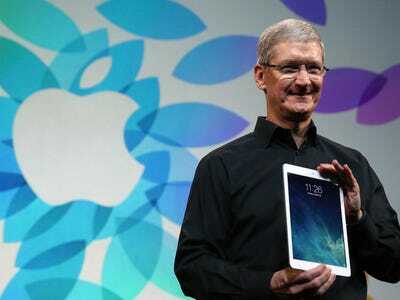 Instead, rumours suggest that the company will focus on its new 12-inch “iPad Pro” instead. 2. Taylor Swift removed all her music from Spotify. Sources says it’s because her record label is being sold. 3. Microsoft is developing a new Skype Translator. It will translate calls in real-time. 4. Sprint announced its Q3 earnings. Stock was down 6% after it announced losses. 5. Christian Bale has dropped out of a new movie about Steve Jobs. Sources says he felt Danny Boyle’s film wouldn’t be a good fit for him. 6. YouTube co-founder Chad Hurley has purchased part of a soccer team. The Los Angeles Football Club will debut in 2017. 7. Samsung’s new curved-screen smartphone will cost $US946 without a contract. It launches next week. 8. Apple executive Eddy Cue sold $US28 million worth of stock last week. He’s in charge of the company’s software and services. 9. Apple will open a software office in Seattle. It’s the company’s first office in the Northwest. 10. Verizon and AT&T are planning on supporting HD voice calls by 2015. They’re also going to focus on video calls.